So…I just got some good news. The story I workshopped at FenCon last year is now a FINALIST in the Writers of the Future contest! That means it beat out thousands of other stories from around the world and is now in the top 8 to be voted on for 1st, 2nd, and 3rd. I’m very excited! I can’t say what story it was because the judges may see my post and be influenced, but this is very cool! I had had a story make Honorable Mention in the contest a few years ago–which is an honor. But this…this is pretty sweet. I’ll keep you posted! 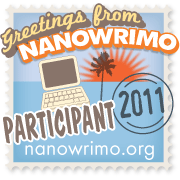 So, for the first time in about 5 years, I’m going to participate in NaNoWriMo this year. I’ve been neglecting my writing for too long and I’m hoping this will get me back on that horse. So, if you’re participating in NaNoWriMo this year, look me up. I’m “pencilneckgeek.” I’m always happy to be a writing buddy. Last week I took an online writing class hosted by incomparable Cat Rambo on writing steampunk and weird western fiction. The class was a 2-hour Google hangout where the participants not only got a great brief history of the genres, but an interesting discussion of the tropes/traditions/trappings of the genres and great ways to use them and yet ensure that you are doing something fresh, new, and (most importantly) page-turningly exciting with them. It was a great experience and I fully intend to take advantage of some of the other online courses that Cat offers. For more info on the classes Cat is offering, go to http://www.kittywumpus.net/blog/upcoming-online-classes/. Full-disclosure: My wife and I are currently playing a Deadlands campaign together. It’s great game with an interesting poker card-based mechanic and a setting bubbling over with the possibility of great stories. So when I saw that Jonathan Maberry (Dead of Night, Rot & Ruin, King of Plagues) had written a novel based in that world, I was there faster than a silver bullet. Grey Torrance is a gunman who is constantly running from the literal ghosts of his past. Putting his nose where it doesn’t belong embroils him in the machinations of a robber baron with dreams of conquest who is sucking the town of Paradise Falls dry of resources and people. With the guidance of Thomas Looks Away, a Sioux scientist, and the drive of the beautiful and fiery rancher Jenny Pearl, Grey seeks redemption in the impossible defense of the town. Ghostwalkers is the first in a trio of tie-in novels set in the Deadlands universe. And it is a great opener. Maberry does an excellent job of painting the setting and creates a whiz-bang plot for the characters to play in. There are strange ghost-rock powered gizmos, plenty of zombies, Harrowed gunslingers, mad scientists, fell creatures from deep beneath the earth, and even undead dinosaurs thrown into the mix. This is a tale of high adventure and Maberry delivers. The writing is punchy and the dialog is fun. Each chapter ends on a bit of a cliffhanger, throwing you into the next step along the way. It’s just good, pulpy writing and keeps you interested, even during the expository bits. The characters are a bit one-dimensional, but still engaging. There is just so much going on that there isn’t much time for deep character development–and, really, this plot-driven pulp. Deep character study isn’t really necessary. The Sioux character of Looks Away is slightly problematic. While Maberry doesn’t dip into Native American cliche’s with the character, the scientist’s British mannerisms are a bit forced–especially as it is established that he didn’t go to England until he was 20 years old. Ghostwalkers is a ripping yarn, a wild roller-coaster ride of a novel, and a great introduction to the weird western world of Deadlands.